This article is about the indigenous people of Hatti. For other uses, see Hatti (disambiguation). Not to be confused with Haitians. The Hattians (/ˈhætiənz/) were an ancient people who inhabited the land of Hatti in central Anatolia (present-day Turkey). The group was documented at least as early as the empire of Sargon of Akkad (c. 2300 BC), until it was gradually absorbed c. 2000–1700 BC by the Indo-European Hittites, who were subsequently associated with the "land of Hatti". "Land of the Hatti" is the oldest known name for central Anatolia, albeit as an exonym in extraneous sources, such as the Assyrian hatti matu, found on Mesopotamian cuneiform tablets from the period of Sargon the Great of Akkad c. 2350–2150 BC; on those tablets Assyrian-Akkadian traders implored King Sargon for help. This appellation continued to exist for about 1,500 years until 630 BC, as stated in Assyrian chronicles. According to later Hittite documents, Sargon the Great had fought with the Luwian king Nurdaggal of Burushanda, while Sargon's successor Naram-Sin of Akkad had battled Pamba, king of Hatti and 16 other confederates. The use of the word "Proto-Hittite" to refer to Hattians is inaccurate. Hittite (natively known as Nešili, "[in the language] of Neša") is an Indo-European language, linguistically distinct from the Hattians. The Hittites continued to use the term Land of Hatti for their new kingdom. 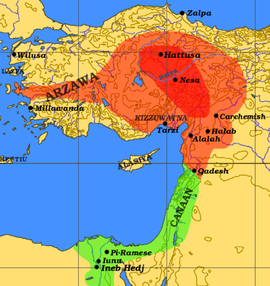 The Hattians eventually merged with people who spoke Indo-European languages like Hittite, Luwian, and Palaic. Approximate extent of Hittite rule, c. 1350–1300 BC, with Arzawa rule and Lukkans to the west, and Mitanni rule to the southeast. The Hattians were organised in city-states and small kingdoms or principalities. These cities were well organized and ruled as theocratic principalities. Evidence of a 'Hattic' civilization is provided by the remnants of one of the non-Indo-European languages found in the later Hittite archives.The language is identified in several of the texts in which it appears by the term hattili- '(written) in the language of Hatti.' The few texts that survive are predominantly religious or cultic in character. They provide us with the names of a number of Hattic deities, as well as Hattic personal and place-names. About 150 short specimens of Hattian text have been found in Hittite cuneiform clay tablets. Hattian leaders perhaps used scribes who wrote in Old Assyrian. Ekrem Akurgal wrote, "the Anatolian princes used scribes knowing Assyrian for commerce with Mesopotomia as at Kanesh (Kültepe)" to conduct business with Assyria. From the 21st to the mid-18th centuries BC, Assyria established trade outposts in Hatti, such as at Hattum and Zalpa. Scholars have long assumed that the predominant population of the region of Anatolia "in the third millennium [BC] was an indigenous pre-Indo-European group called the Hattians." But it is thought possible that speakers of Indo-European languages were also in central Anatolia by then. The scholar Petra Goedegebuure has proposed that before the conquest of the Hittites, an Indo-European language, probably Luwian, had already been spoken alongside the Hattic language for a long time. Hattian became more ergative towards the New Hittite period. This development implies that Hattian remained alive until at least the end of the 14th century BC. Alexei Kassian proposed that the Northwest Caucasian languages (also known as Abkhazo-Adyghe), which are syntactically subject–object–verb, had lexical contacts with Hattian. Hattian religion traces back to the Stone Age. It involved worship of the earth, which is personified as a mother goddess; the Hattians honored the mother goddess to ensure their crops and their own well-being. The Hattian pantheon of gods included the storm-god Taru (represented by a bull), the sun-goddess Furušemu or Wurunšemu (represented by a leopard), and a number of other elemental gods. Reliefs in Çatal Höyük show a female figure giving birth to a bull, i.e. the mother-goddess Kattahha (or Hannahanna) was mother to the storm-god Taru. Later on the Hittites subsumed much of the Hattian pantheon into their own religious beliefs. James Mellaart has proposed that the indigenous Anatolian religion revolved around a water-from-the-earth concept. Pictorial and written sources show that the deity of paramount importance to the inhabitants of Anatolia was the terrestrial water-god. Many gods are connected with the earth and water. In Hittite cuneiform, the terrestrial water god is generally represented with dIM. The storm gods of Anatolia were written with about one hundred catalogue variants of dU, mostly described as the Stormgod of Hatti or with a city name. Some scholars thought that Hattians and Hittites had perhaps different personal characteristics, though most Anatolian societies in the Bronze Age were multi-lingual. Egyptian depictions of the Battle of Kadesh reportedly show long-nosed Hattian soldiers, while their Hittite leaders looked different according to Turkish archaeologist Ekrem Akurgal. [unreliable source?] This claim is dubious however as the vast majority of contemporary depictions of Hittites show no phenotypical difference between Hittite elite and commoners. ^ C. Scott Littleton (2005). Gods, Goddesses, and Mythology. Marshall Cavendish. pp. 692–. ISBN 978-0-7614-7559-0. Retrieved 26 March 2013. ^ Charles Burney (19 April 2004). Historical Dictionary of the Hittites. Scarecrow Press. pp. 19–. ISBN 978-0-8108-6564-8. Retrieved 26 March 2013. ^ Hutter, Manfred (1997). "Religion in Hittite Anatolia. Some Comments on "Volkert Haas: Geschichte der hethitischen Religion"". Numen. 44 (1): 74–90. doi:10.2307/3270383 (inactive 2018-08-22). JSTOR 3270383. ^ Green, Alberto. R.W. (2003). The Storm-God in the Ancient Near East. Wioana Lake: Eisenbrauns. pp. 89–103. ISBN 978-1-57506-069-9. ^ a b Ekrem Akurgal, The Hattian and Hittite Civilizations, Publications of the Republic of Turkey: Ministry of Culture, 2001, p. 8 Akurgal writes here: "The large-nosed soldiers identified as "Hitti" in the Egyptian temple depictions of the Battle of Kadesh show a different ethnic type from their [Hittite Indo-European?] kings in the same scenes". Wikimedia Commons has media related to Hattians.